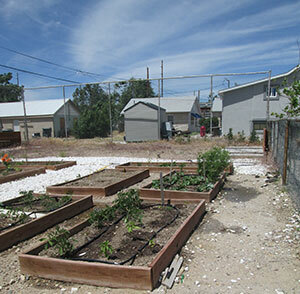 Still in its infancy, Seeds of Change community garden provides local fresh food for the food dessert of Mills, Wy. Photo by Trish Popovich. The ‘grow local buy local’ movement has finally arrived in Wyoming, but informing Wyomingites about food justice, food deserts and the importance of locally produced organic food sources can be a challenge. Luckily, Jamie Purcell, Executive Director of the startup Wyoming Food for Thought Project, a 501 (c)3 founded in 2012, is facing the challenge head on and so far, it’s working. After discovering a lifelong dream of becoming an architect didn’t live up to the reality, Purcell spent time in several nonprofits beginning with a year in the AmeriCorps program, living in poverty while assisting in summer programs for low income children. After a disappointing experience with the Food Bank of the Rockies, Purcell decided that Wyoming deserved a food assistance program that didn’t offer only shelf-stable, processed food, but actually gave low-income community members the tools to eat healthier through cooking workshops, community gardens and a network of passionate volunteers wanting to give a hand up and not just a hand out. That’s when Purcell approached the local school district and asked to take over the weekend backpack program. Today, the Wyoming Food for Thought Project distributes weekend backpack meals to 300 children in Casper, WY and the effort continues to grow. Currently, the backpacks contain food that children can prepare without the assistance of adults. Volunteers arrive at the Wyoming Food for Thought Project facility, which is currently space leased in the back of a local church building to sort donations, pack them into bags and deliver them to local foods for Friday afternoon distribution. The Wyoming Food for Thought Project holds programming throughout the year to spread the message of child hunger and local foods, often collaborating with local partners. Many Casper businesses and events allow people to donate food (usually a jar of peanut butter) in lieu of an entrance fee or for a discount on services rendered. Many businesses hold collection drives and churches have monthly donation offerings. Purcell cites branding and passion as the best ways to grow a food-based nonprofit. By staying independent of national food bank organizations, Purcell can guarantee to donors that their money stays local. The Seeds of Change community garden provides low-income locals with a place to grow organic produce for their families. The garden is only three years old and was taken over by Purcell June 1st of this year. Future plans include a farm stand and general store filled with local produce.